NA-3803 A SUPERB NORTHWEST COAST WOOD BEAR FIGURE Circa 1870-1900. Tlingit or Kaigani Haida Tribe, Alaska. Red cedar or spruce; abalone shell inlays. Provenance: A Private Canadian Collection, Vancouver, British Columbia. An essay by Steven Brown, the former Curator of Native Art at the Seattle Art Museum, an expert on Northwest Coast art, as well as a renowned artist in his own right, wrote a report on this finely carved figure, and illustrates his admiration of this piece. This report is included with acquisition,and available to interested parties who might request to receive it. This masterfully carved small bear is symbolic of a clan representation of strength and power, and a possible maquette for a larger sculpture. Seated, with arms held outward, the mouth partially open, the abalone shell inlays artistically capture the charm of the bear's gaze. 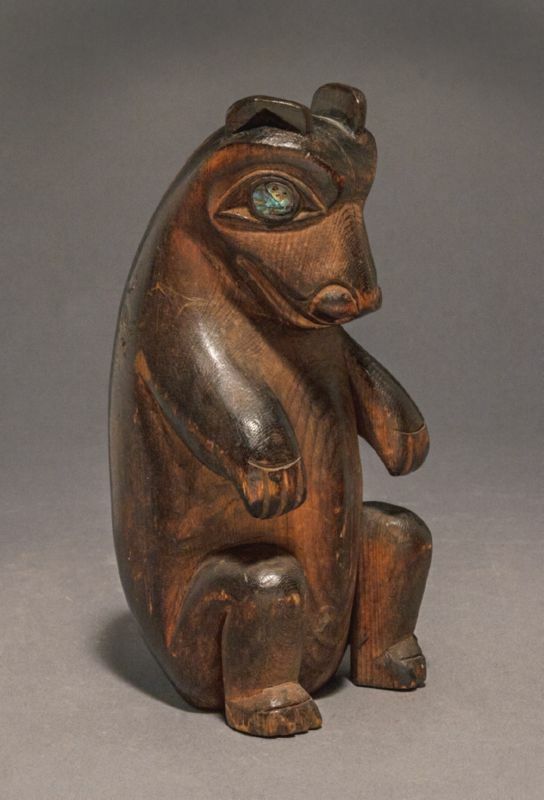 A similar, but sculpturally inferior carved bear figure was sold at Sotheby's, New York, Important Northwest Coast American Indian Art, May 21, 2014. According to Mr. Steve Brown, it is a newer carving which probably used our bear as the model.